Giovanni Battista Pamphili commissioned a grand organ from the Flemish Jesuit Guglielmo Hermans, to be installed in the cantoria immediately above the church entrance; at the same time he created the position of the church musical director, at the head of a permanent choir. The organ was remodelled in the early 1800s and then completely rebuilt in 1914. What we now see is an instrument constructed by the Walcker family of Ludwigsburg, Germany, featuring the technologies and tonal colours of the Romantic era. The new organ, with two keyboards and a pedal-board, includes some parts from the ancient instrument, in particular the tin organ pipes. In addition to the main organ the church also possesses a smaller chamber organ in Neapolitan style, showing the maker’s mark ‘PASQUALE (G)IANTOSCA 185(?)’. The organ was recently restored under the guidance of the organ-builder Carlo Soracco. The organ is a positive type with a single manual. The keyboard features 50 keys (Do4-Fa5), with a ‘scavezza’ or short first octave. The diatonic keys are in birch with bone veneer; the chromatic keys are in ebony. 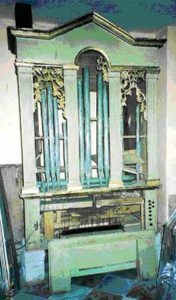 Over the years of its life the organ had lost many parts, including the base and almost all the pipes. The restoration therefore required reconstruction of the internal pipes and some of those seen in the facade. The restoration of the instrument brought to light signs of different working techniques and materials. 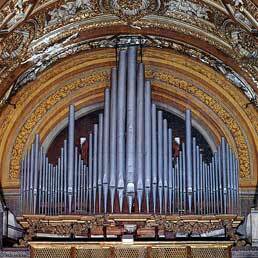 From the examinations it was concluded that the bellows, exterior case and wooden pipes of the principale (unison pitch) and octave ranks are of 1700s construction, while the main wind chest and keyboard are almost certainly the later work of Giantosca. We can observe that while working in the mid-1800s, Giantosca continued to use materials more typical of the original 1700s era. 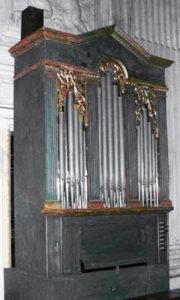 The organ is constructed with several accessory registers: the zampogna or ‘reeds register’, named for a type of Italian bagpipe, and the uccelliera (literally ‘bird-house’), a register composed of small pipes inverted in a water chamber ‒ the passage of the sound through water produces a warble similar to that of birds. The accessory registers are controlled from stops to the left of the keyboard. Also on this side is the locking lever for control of the first octave of the principale.